Digital Subscriptions > Learn Hot English > 175 > Go Green! A new study shows the benefits of green spaces. What do you think the health benefits of “green spaces” are? Make a list. Then, read the article to check your ideas. How good is your memory? 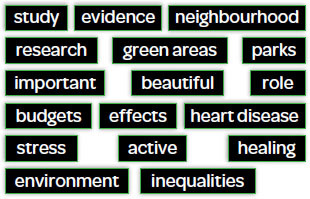 Memorise these key words from the article. When your teacher tells you to stop, cover the words and write down the ones you remember. After studying the words, guess what the article is about.